Following its highly successful participation at CabSat 2017 exhibition and conference, Romantis has closed several deals in Western Central and South Asia. It was possible thanks to recent repositioning of the steerable beams of Express AM7 and Express AM22. The capacities of these satellites will be used for different applications including TV broadcasting, Satellite News Gathering (DSNG), VSAT networking and communication on the move. 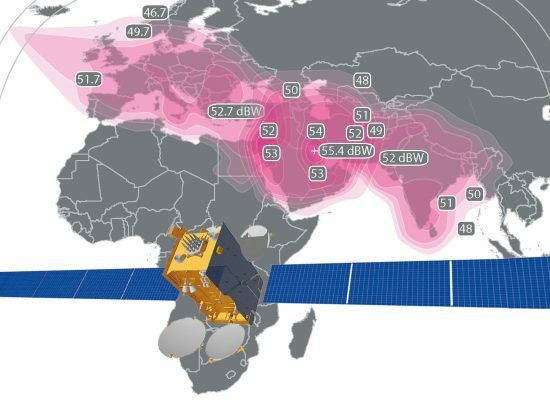 The key motivation of choosing Express AM7 for this region is because of seamless coverage from Western to South Asia and extremely strong power of the satellite exceeding 54 dBW. It is necessary to mention about high elevation angles of the satellite located at 40 degrees East what makes this solution highly applicable for mobile communications. Our customers from Pakistan, Afghanistan and Iran have already evaluated all the benefits of the satellite and intensively expanding their networks. “RSCC and Romantis successfully cooperate in the joint implementation of projects in Europe, Africa, the Middle East and Latin America. We hope that this agreement will allow us to expand cooperation in the Asian market, which is strategically important for both companies,” notes Kseniya Drozdova, RSCC Deputy General Director for Business Development. With such portfolio Romantis has strong capabilities to compete on the Asian market and expand its services well-known in Europe, Africa and the Middle East. Romantis is committed and very excited about this market and is open for cooperation with regional and global partners.